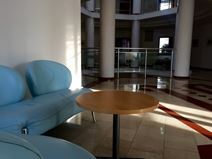 Office Space - Astana, South Kazakhstan. This workspace solution is the perfect destination for forward thinking companies that desire practicality, functionality as well as convenience. Found in Astana, the capital of Kazakhstan, this prestigious business centre offers a range of office options to your business. Just a short drive away, you can reach the impressive Alaqol State Nature Reserve, where you can observe sprawling views of mountains and hillsides.